Fasten your seat belts -- we're faster, heavier, and more likely to collide than we thought. Astronomers making high-precision measurements of the Milky Way say our home Galaxy is rotating about 100,000 miles per hour faster than previously understood. That increase in speed, said Mark Reid, of the Harvard-Smithsonian Center for Astrophysics, increases the Milky Way's mass by 50 percent, bringing it even with the Andromeda Galaxy. "No longer will we think of the Milky Way as the little sister of the Andromeda Galaxy in our Local Group family." Our Solar System is about 28,000 light-years from the Milky Way's center. At that distance, the new observations indicate, we're moving at about 600,000 miles per hour in our Galactic orbit, up from the previous estimate of 500,000 miles per hour. The scientists are using the National Science Foundation's Very Long Baseline Array (VLBA) radio telescope to remake the map of the Milky Way. Taking advantage of the VLBA's unparalleled ability to make extremely detailed images, the team is conducting a long-term program to measure distances and motions in our Galaxy. They reported their results at the American Astronomical Society's meeting in Long Beach, California. The scientists observed regions of prolific star formation across the Galaxy. In areas within these regions, gas molecules are strengthening naturally-occuring radio emission in the same way that lasers strengthen light beams. These areas, called cosmic masers, serve as bright landmarks for the sharp radio vision of the VLBA. By observing these regions repeatedly at times when the Earth is at opposite sides of its orbit around the Sun, the astronomers can measure the slight apparent shift of the object's position against the background of more-distant objects. "The new VLBA observations of the Milky Way are producing highly-accurate direct measurements of distances and motions," said Karl Menten of the Max Planck Institute for Radio Astronomy in Germany, a member of the team. "These measurements use the traditional surveyor's method of triangulation and do not depend on any assumptions based on other properties, such as brightness, unlike earlier studies." The astronomers found that their direct distance measurements differed from earlier, indirect measurements, sometimes by as much as a factor of two. The star-forming regions harboring the cosmic masers "define the spiral arms of the Galaxy," Reid explained. Measuring the distances to these regions thus provides a yardstick for mapping the Galaxy's spiral structure. "These direct measurements are revising our understanding of the structure and motions of our Galaxy," Menten said. 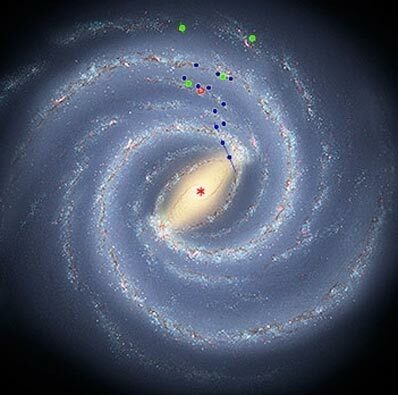 "Because we're inside it, it's difficult for us to determine the Milky Way's structure. For other galaxies, we can simply look at them and see their structure, but we can't do this to get an overall image of the Milky Way. We have to deduce its structure by measuring and mapping," he added. The VLBA can fix positions in the sky so accurately that the actual motion of the objects can be detected as they orbit the Milky Way's center. Adding in measurements of motion along the line of sight, determined from shifts in the frequency of the masers' radio emission, the astronomers are able to determine the full 3-dimensional motions of the star-forming regions. Using this information, Reid reported that "most star-forming regions do not follow a circular path as they orbit the Galaxy; instead we find them moving more slowly than other regions and on elliptical, not circular, orbits." The researchers attribute this to what they call spiral density wave shocks, which can take gas in a circular orbit, compress it to form stars, and cause it to go into a new, elliptical orbit. This, they explained, helps to reinforce the spiral structure. Reid and his colleagues found other surprises, too. Measuring the distances to multiple regions in a single spiral arm allowed them to calculate the angle of the arm. "These measurements," Reid said, "indicate that our Galaxy probably has four, not two, spiral arms of gas and dust that are forming stars." Recent surveys by NASA's Spitzer Space Telescope suggest that older stars reside mostly in two spiral arms, raising a question of why the older stars don't appear in all the arms. Answering that question, the astronomers say, will require more measurements and a deeper understanding of how the Galaxy works. The VLBA, a system of 10 radio-telescope antennas stretching from Hawaii to New England and the Caribbean, provides the best ability to see the finest detail, called resolving power, of any astronomical tool in the world. The VLBA can routinely produce images hundreds of times more detailed than those produced by the Hubble Space Telescope. The VLBA's tremendous resolving power, equal to being able to read a newspaper in Los Angeles from the distance of New York, is what permits the astronomers to make precise distance determinations. The National Radio Astronomy Observatory is a facility of the National Science Foundation, operated under cooperative agreement by Associated Universities, Inc. Headquartered in Cambridge, Mass., the Harvard-Smithsonian Center for Astrophysics (CfA) is a joint collaboration between the Smithsonian Astrophysical Observatory and the Harvard College Observatory. CfA scientists, organized into six research divisions, study the origin, evolution and ultimate fate of the universe.